the sheer thrill of riding whitewater rapids under the watch of professional guides. rugged, high-desert canyons and wildlife! Welcome to Sage Canyon River Company, the Oregon river rafting company dedicated to providing adventurous people with the thrill of a lifetime. Here at Sage Canyon River Company we have a passion for fishing, camping and white water rafting. We love the outdoors and enjoy all that Oregon and the Deschutes River has to offer. That is why we started this company. We want to share our passion with others looking take advantage of the beauty and excitement provided by the rushing Deschutes River and the majestic Oregon frontier. Sage Canyon River Company operates white water rafting tours on the wild and scenic Deschutes River near Maupin, Oregon. 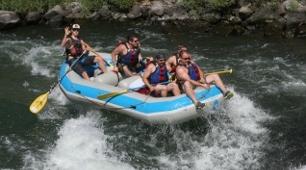 Our white water rafting adventures in Oregon are suitable for all levels of fitness and enthusiasm. We are a vibrant, innovative and highly professional whitewater rafting guide and tour company utilizing the latest in white water rafting technology and safety standards. From our gourmet meals to our entertaining and highly qualified river guides, Sage Canyon strives to give you the best whitewater rafting experience possible. So whether you are looking for a 3 hour, a 6 hour, an overnight or a multi day Oregon river rafting adventure Sage Canyon River Company can make it happen. Come experience all that the fantastic state of Oregon and the beautiful Deschutes River has to offer. You won’t be disappointed. Our Deschutes river trips are second to none. Begin this action-packed adventure at Harpham Flats on the Deschutes River. Tackle a series of Class III and IV rapids, including the infamous Box Car, before stopping at Maupin City Park for a delicious BBQ steak and chicken lunch. These river camping trips are guaranteed to soak away your cares and stimulate your senses. Traveling 40+ miles on the remote areas of the river will offer you a glimpse into history and thrills to remember. Traveling 55 miles on the remote areas of the river will offer you a glimpse into history and thrills to remember. Enjoy some of the largest and most exciting rapids on the river.